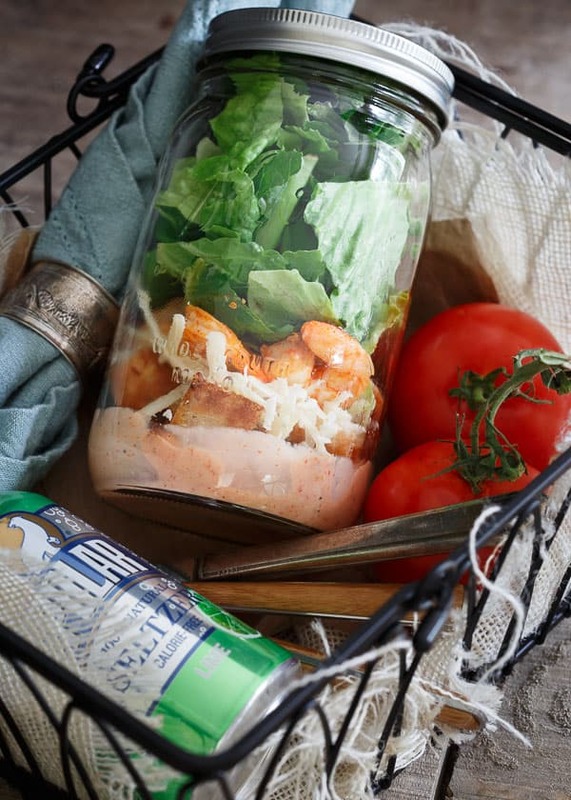 This sriracha shrimp caesar salad is made right in a mason jar for an easy, portable lunch. It’s spicy, salty and packed with protein. 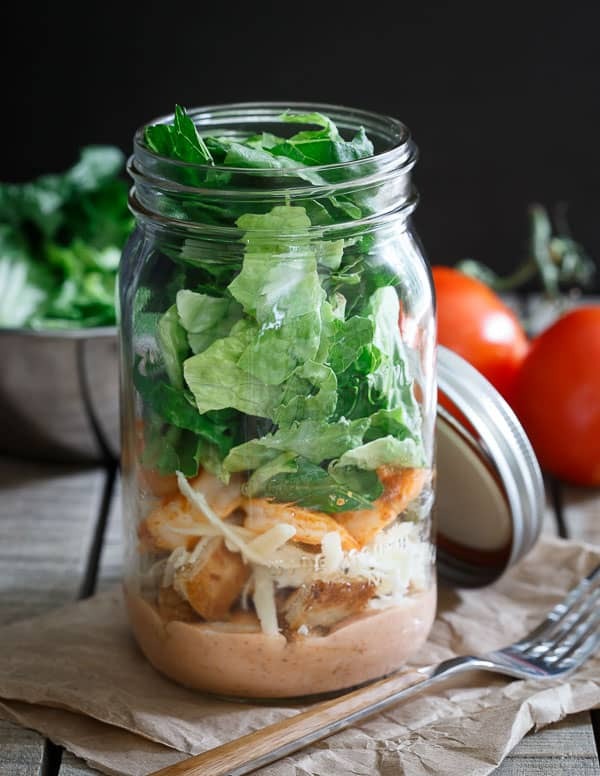 I’ll fully admit I didn’t get the point of this mason jar salad trend until recently. It just seemed so stupid to me as I sat there wondering why you’d shove all the ingredients of a salad into a jar and how you’d get your fork all the way to the bottom to eat it! Then I realized it’s the whole convenience factor for portability and even more important, an excellent way to keep the dressing from turning the lettuce soggy or requiring an extra container (I have a weird hatred towards those small little tupperware containers) to carry it in to avoid that. Hindsight is 20/20 I guess because now I realize the whole concept is actually kind of genius. Ulysses has a Caesar salad addiction. I’m not even exaggerating when I say that. Of all things on this planet to eat, that is his go-to meal. If we’re at a restaurant and he decides he doesn’t want to bother looking at the menu (something I’ll never understand), Caesar salad it is. From fast food drive thru windows (he’s a big fan of Wendy’s side salad rendition of it) to the diner and everything in between, 95% of the time, a Caesar salad will somehow make its way into his meal. It usually drives me nuts but it also gave me the idea for this spicy shrimp spin on the classic salad, so I guess I can’t complain. Making Caesar dressing from scratch the “real” way uses raw egg yolk (and anchovies so put on your big kid pants and get over the little fishy, it’s not going to hurt you). Safest Choice™ pasteurized eggs are perfect for this recipe so you can eliminate any idea for worry when it comes to enjoying a classic Caesar. Sriracha is added to both the shrimp and the dressing for a good kick of spice. Don’t worry though, it’s offset by the salty parmesan and refreshing crispy romaine. 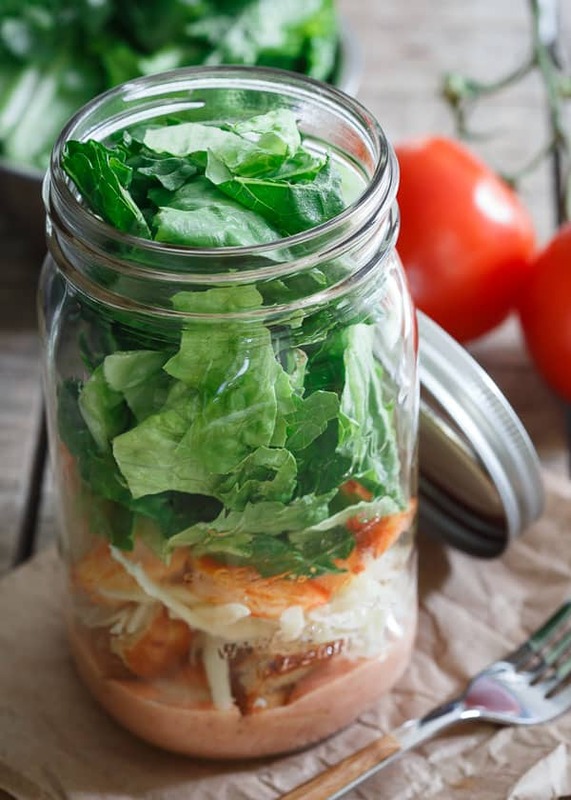 Stick it in a mason jar and take it to work for a quick and easy lunch, out on a picnic or, just toss it up in a bowl at home, either way it’s a spicy delicious take on the classic. Chop the anchovy, garlic, and salt together until minced. Use the side of the knife blade to mash the mixture into a paste-like consistency. Place in a small bowl and whisk in the egg yolk, lemon juice, and mustard. Slowly drizzle the olive oil while continuing to whisk. Add Parmesan and season with the black pepper to taste. Lastly, stir in sriracha until fully incorporated. Set aside. Combine the shrimp and sriracha in a small bowl and toss to coat. Heat a skillet over medium-high heat. Once hot, add the shrimp to the pan and cook for 1-2 minutes per side until pink. 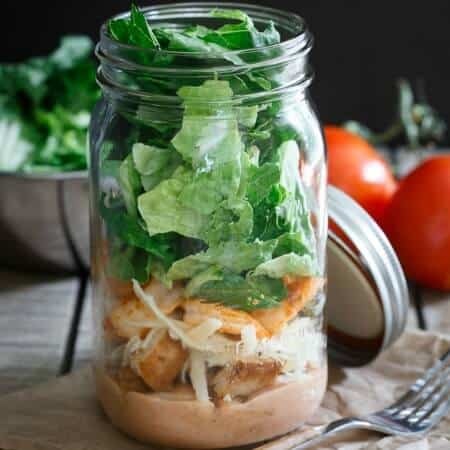 Pour the dressing into the bottom of mason jar. Add the croutons, grated Parmesan, and shrimp. Top off with as much romaine lettuce as will fit in the remaining space. Seal the lid and the salad is ready. i like doing pasta salads this way but with greens, im with you about having to shove my fork and all that. Actually it’s even easier than that. You don’t eat the salad from the jar, you dump it out into a bowl when you’re ready to eat so all the dressing and ingredients you added first will then be over the greens.